A couple months ago I finally had the opportunity to delve into last October’s release of Universal’s Alfred Hitchcock: The Masterpiece Collection on Blu-ray, a simultaneously rewarding and frustrating experience. In each case the Blu-ray versions offer visible, and in some cases major, improvements over the older DVDs. But a number of the discs also betray a surprising degree of inconsistency and carelessness. Based on what I am seeing in the transfers, it appears that many (but not all) of the problems in the set are due in part to improperly applied or overly broad “grain-management” or digital video noise reduction tools at the encoding stage. Since Universal is releasing many of discs individually starting this summer, it will be interesting to see whether some of the problems identified below get fixed in the stand-alone releases. There are already numerous reviews online, so I will forego detailed reviews for every disc in the set; the bulk of this piece will focus on the grain problems I observed. I recommend that you track down the reviews by Robert Harris in his column at Home Theater Forum. His takes on the individual discs are summarized here. Another knowledgeable source is Nick Wrigley, a longtime DVD and Blu-ray producer for Masters of Cinema, who authored the must-read essay “Crimes Against the Grain” for the December 2012 issue of Sight and Sound. He has reviewed the Hitchcock Blu-rays on his blog. On the positive side, the black-and-white films (Saboteur and Shadow of a Doubt) look excellent. In Rope the encoding seems OK, but the 35mm print used contains prominent color fringing due to misaligned Technicolor matrices. This might require an expensive restoration to fix, assuming that it is even technically possible. The Man Who Knew Too Much benefits from the enhanced detail of the VistaVision format, but the color is very uneven. Not only do some sequences have a prominent yellowish tinge, but even within individual sequences the color timing does not always match up well between shots. I think that Universal could have gotten much better results with this film if they had spent more time on it. The Trouble with Harry is largely excellent, though it has a curious visual artifact–occasional ghosting in the image–that I believe has to do with jumping frames or registration problems and may be inherent to the VistaVision negative. Since VistaVision used a horizontally fed 35mm negative, any such jumping would have been side-to-side rather than vertical, and indeed the ghosting is horizontal. My initial impression is that Vertigo looks strong throughout, perhaps because it was shot in Vistavision and thus has high density of detail and a finer grain structure. I found myself spotting many details in the production design that I had not noticed before. Here is where we get to the grain problems. Rear Window. The new transfer mostly looks gorgeous. But in one shot at the beginning, mesh-patterned grain briefly appears in the sky. Several shots also have had too much grain removed. The iconic shot of Grace Kelly kissing James Stewart is marred by sharp horizontal banding in the background, an basic video compression artifact. This is difficult to forgive, since it is one of the best-known shots in the film. Still, the detail and color are mostly excellent on this Blu-ray. The Birds. I recently saw a new 35mm print of the film, and the Blu-ray’s overall look closely follows that print, including the minor discrepancies in the look of location versus studio footage and the heavily diffused closeups of Tippi Hedren. I am sympathetic with Harris’s point about the need to use noise reduction and grain equalization for a consistent look on video because of the many process shots and complex production history of the film. Even so, there are places where the grain seems to swim on top of the image, and at times it becomes distracting. Marnie. The color looks good, but the encoding contains a very obtrusive layer of digital noise (or faux grain). If you are viewing from a smaller screen or from a distance, it may be less obvious. I found it obvious indeed on my 46” Samsung LCD TV. As Nick Wrigley observed, for some strange reason it clears up suddenly in the last couple reels of the film. However, the color timing also changes markedly at that point–the skin tones take on a purplish hue. The kind of mesh-patterned grain mentioned above in Rear Window is very prominent in the first shot of the film. Some reviewers have expressed uncertainty whether this mesh pattern in the sky is something inherent to the photographic image, but I am inclined to say that it is a video encoding artifact given its brief presence in Rear Window as well. Marnie should have looked a lot better than it does. Frenzy. A monumental failure. They have gone completely overboard with DVNR so that the image has a waxy look throughout; critical detail has been scrubbed away. During a key point in the film–when the camera backs down a stairway and out the door–digital banding becomes all obvious, blunting the scene’s emotional impact. As with Rear Window, these artifacts appear in what is arguably the film’s most famous shot. 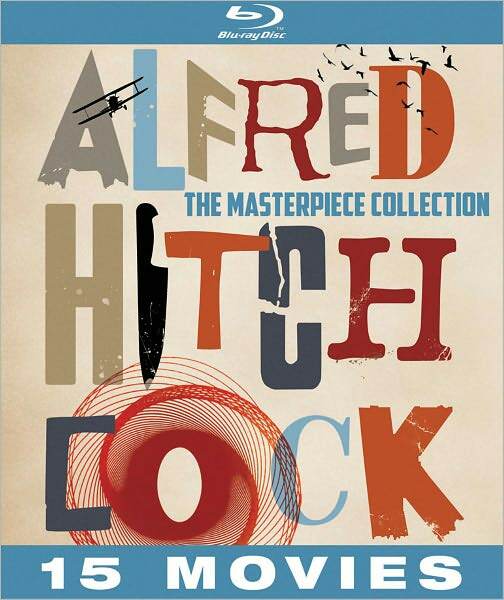 How can a major company like Universal release a Blu-ray like this for the most important film in late-period Hitchcock? Family Plot is indeed the disaster that everyone claims, and if there were any justice Universal would recall the disc and set up an exchange program. The encoding software appears to be fighting the heavily fluctuating grain levels on the print and losing badly. Many shots crawl with digital faux-grain as a result. I suspect that Universal could have obtained better results simply by dialing down the filters and allowing the grainy, mediocre look of the old transfer to stand on its own. Nobody would have been thrilled with the results, and it still would have been the weakest Blu-ray in the set, but it might have been acceptable. Even so, it still looks better than the DVD in the older red velvet Masterpiece Collection DVD box set. Revisiting that DVD, I was surprised at just how bad it looked in retrospect. To be fair, the films in this collection were made over a span of more than thirty years (1942-1976), during which time film stocks changed a great deal, as did studio production practices in general. Moreover, it is understandable that Universal would invest more resources into the transfers of Rear Window and Vertigo than they would some of Hitchcock’s lower profile films. But even allowing for these practical considerations, Universal still could have spend more time and effort to bring these Blu-rays up to the level of standard catalog releases by the other major studios. They are Hitchcock films, after all. I’m glad I bought the set, but equally glad that I picked it up for a substantial discount (a well-timed Amazon Lightning Deal late last year) – I reckon I ended up paying a fair price for the high-quality Blu-rays and could regard the mediocre-to-terrible ones as a free bonus. I’m a lot more inclined to forgive The Birds‘ faults than some have been because a film with that many process shots is always going to be a challenge to render convincingly on Blu-ray, but Marnie, Frenzy and especially Family Plot are indeed abysmal, with the latter very possibly the worst Blu-ray transfer in my entire collection. That’s a fair-minded way to approach it. Honestly, The Birds might not have looked problematic if I had not been viewing it alongside all the more seriously flawed titles and considering them together. Its faults are quite minor compared to those in Marnie, Frenzy and Family Plot. What annoys me is that Marnie and Frenzy are two particular favorites of mine. I’m glad that I did not buy the set, even at a discount, but checked out my library’s copy a couple of times for close study. It may be too much to hope for, but perhaps Universal will fix the most problematic titles when they release them individually. Family Plot is indeed a disaster on Blu Ray. I recently bought an upcoding Samsung 4K 65 inch TV. On this set, the super grainy Family Plot is so hard to look at I turned it off. I’ll wait until someone figures out how to do this transfer better. It’s a shame that Hitch doesn’t get more respect. I found Frenzy to be OK, although it has a little of that “soap opera effect” look. I looks like the boys in the lab must’ve been distracted or maybe they just didn’t care.